As a child growing up the daring deeds of Karl Mullen, Jack Kyle and the Grand Slam-winning side of 1948 seemed the absolute zenith in terms of Irish rugby achievement and where we might go. That team captained by Mullen, and with just 20 players used in the four matches, took out the French (13-6) at Stade Colombes and the English at Twickenham (11-10), before getting the better of the Scots (6-0) at Lansdowne Road and then sealing it by beating the Welsh (6-3) at Ravenhill. There was no Aviva or Kingspan back then and of course very different scoring values too. I think it is interesting to note that Ireland crossed for nine tries - adding just three conversions through placed kicks. There was not a single penalty kick in the four Championship-winning games. From 1949 until 1982 there was no Triple Crown, although in '51 and '74 we did take the Five Nations Championship outright. That '74 team captained by Willie John McBride might have moved up alongside the legends of '48 had the Troubles not intervened two years before, when having beaten France (14-9) at Stade Colombes and England (16-12) in Twickenham, Scotland and Wales, following political advice, decided not to travel for security reasons. We will never know what might have ensued but from Ray McLoughlin through to Tom Kiernan and including so many legendary Irish rugby players (Mike Gibson and Fergus Slattery but two) that was a period in Irish rugby to rank with the very best. So too the early to mid-'80s when Ciaran Fitzgerald and Ollie Campbell were at the heart of the big breakthrough with the former every bit as inspirational again three years on. It is often forgotten that Mick Doyle's 'Give it a lash side' of '85 came closest to emulating '48 when winning three but drawing at home (15-15) to the French in the second game of that Championship. And then came 2009. It is hard to believe we are almost a decade on from that momentous occasion in the Millennium Stadium when the golden generation reached the peak of their considerable powers. Yes, it did come down to a missed Stephen Jones penalty at the death but if ever a group of players had earned the right to Grand Slam success it was that first professional cohort. It would be impossible to compare '48 with '09 given it is amateur against professional but for sure both sides were driven by two of the most talented and undisputed greats of Irish rugby in Kyle and Brian O'Driscoll. What the '09 Slammers do have over the '48 trailblazers is a first Six Nations Grand Slam. That said, given that it was then the Five Nations they achieved the maximum return they could at that time. So apart from acknowledging the greatness in Kyle and O'Driscoll we'll desist from attempting any further comparison. Was '48 or '09 the greater achievement? I tend to lean towards the former when factoring in that 'even year' element whereby it was and still is England and France on the road. 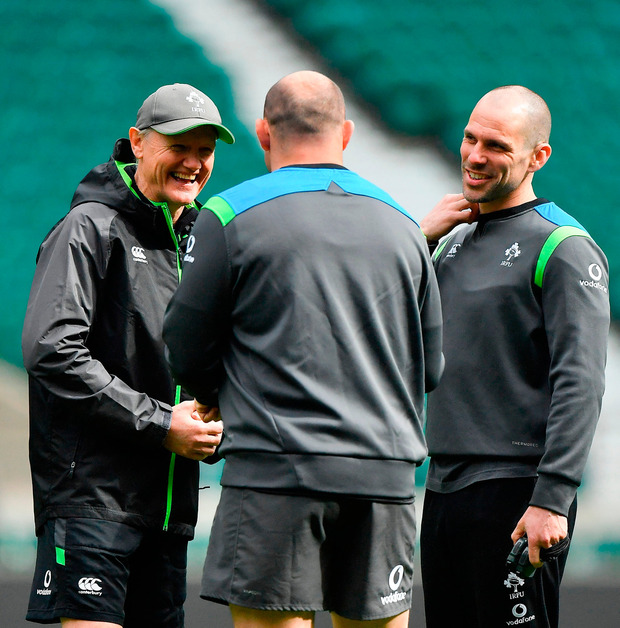 If Joe Schmidt and the class of 2018, already Six Nations champions, are to reach Grand Slam immortality then they must come away with that fifth victory in five at the former cabbage patch this afternoon. It is a huge ask and yet should they come up short I think it will deflect from what has been achieved thus far. I also believe it would make for an equally significant setback on the road to Japan in a little over 18 months' time. To come out of today with five wins from five and be crowned Grand Slam champions would for me represent the greatest achievement in the history of Irish rugby. Better even than that win over the Wallabies at the New Zealand World Cup in 2011. Put simply, and I am not stretching it in the least, today is the biggest game in the history of Irish rugby. My colleague Eamon Sweeney put forward a very strong case, given the international dimension, for the current head coach being the greatest in our sporting history. I am of like mind and while defeat today would not detract from his professionalism or how he goes about his tactical business, winning the Grand Slam would move him to another level entirely. Despite winning our four games to date I still feel we are some way short of that optimum level of performance. That is what really excites. Schmidt now has in place a strength in depth that he has consciously set out to develop. And I don't think it is stretching it to suggest that no one person learnt more from the 2015 World Cup experience than he. Can we win this afternoon? Yes. Can we lose this afternoon? Absolutely. This is a huge challenge against a wounded superpower on their home turf. And clearly hypothetical I know, but how many of this current squad might have made the Declan Kidney line-up a decade ago? For obvious reasons Kearney would be the first name on the sheet but were Tommy Bowe and Luke Fitgerald, then at their best, ahead of the on-fire Keith Earls and Jacob Stockdale now? We thought BOD and Gordon D'Arcy could never be replaced but take any two from Garry Ringrose, Jared Payne, Robbie Henshaw, Chris Farrell and Bundee Aki and they're making a fair fist of it. Johnny Sexton or Ronan O'Gara at out-half? Bold is the man who will make an assertive call on that one. Conor Murray at scrum-half? Yes. Cian Healy or Jack McGrath at loosehead? Both Lions, probably yes. Tadhg Furlong possibly edges the 'Bull' Hayes at tighthead but it's a big call and Jerry Flannery probably just gets the nod for his all-round game in between. Who from James Ryan (a mere bambino), Iain Henderson and Devin Toner to partner POC in the second-row? And what of a back-row of Peter O'Mahony, Dan Leavy (another gasúr) and CJ Stander (not to mention Sean O'Brien) measured against Stephen Ferris, David Wallace and Jamie Heaslip? The respective benches aren't half bad either but, even allowing for Geordan Murphy, Peter Stringer and Denis Leamy in '09 reserve, today's replacement line-up wins hands down. Making comparisons can be odious and most definitely subjective, however when factoring in achievement the case for greatness is much more easily defined. And therein lies the massive challenge for this Irish squad this afternoon. Save for a World Cup final this could be the biggest game they will ever play. Win and immortality beckons, losing doesn't bear thinking about. I am on edge, God only knows how the players must feel. They haven't yet hit their straps but I'll gladly take it if we are one point ahead come five o'clock or thereabouts this afternoon. To borrow from the sitcom back in the day, 'never mind the quality, feel the width'.